GreenThumb IO is dedicated to delivering high tech solutions to the cannabis industry in close collaboration with leading industry partners. (left) Annotated time-lapse video of leaf area in green and bud area in red. (right) Leaf Area Index in green and Bud Area Index in yellow. 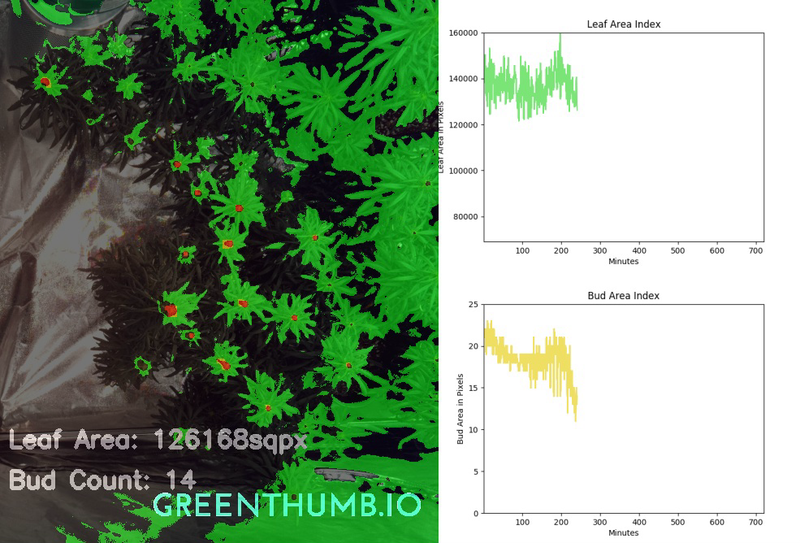 In the video above we have graphed 720 minutes at 20 FPS, visualizing a decay in the KPIs of Leaf Area Index and Bud Area Index. Based on this analysis, a grower would be alerted of the deficiency and offered a recommended action such as watering or fertilizing the plants, which can be triggered remotely. GreenThumb‘s second product offering will be the Harvester App, an app that not only assists growers in tracking their grows and the health of their plants, but will allow industry operators to obtain services, bid for product sales, compete for RFPs (Request for Proposals), and much more. GreenThumb will provide integrations with existing systems that cannabis companies already know and love, while providing the tooling necessary for new vendors to package their offerings on the platform. Key to our vision is the Harvester Marketplace. By using the GreenThumb Computer Vision product, cultivators will be able to market and sell their harvests in the Harvester Marketplace at no cost. This will create a truly seamless experience for growers to automatically list and sell their product alongside robust data to provide buyers with proof of quality and compliance, streamlining processes and creating greater trust in buyer and seller relationships. This harvest data will include operational records such as interactive time-lapse videos, plant health performance metrics, and video captures of human interactions. Growers will also be able to find lower rates on insurance through our platform by proving maintenance and compliance. With Harvester, GreenThumb will develop a network of operators and will allow users to connect to data provider adapters built to integrate with their existing Point of Sales, Seed-to-Sale, Security, Distribution, Sensor Systems, Lab Service, Insurance providers, and accounts, all in a cohesive environment. This comprehensive system will offer service providers new opportunities to target the right audience and grow their businesses. GreenThumb will maintain open source projects that include the Harvester app, Computer Vision components, and the hardware for Smart Camera, Sensor, and Dosing kits. This will benefit the platform by facilitating more collaboration and healthy competition in the market. Companies using the packages in good faith and in compliance with open source licensing will be welcomed as innovators in the GreenThumb movement. As a fully bootstrapped endeavor, GreenThumb is now open to initial seed funding in order to build a team and accelerate growth. Outside of the goals stated above, we ultimately aim to fully automate the cannabis cultivation process within the next three years, becoming the premiere technical provider and source of innovation in the $146B cannabis market globally. Please contact justin@greenthumb.io to get involved.